Today was a good day. I got a mention in The Irish News about my pretty little blog, I’m very honoured and proud of it. So, today was definitely a good day. It’s so rewarding to see your hard work get some recognition for the effort you put into it. Anywho, today I’m wearing an array of beautiful colours to brighten up this dull and boring January. I got my stylish little dress in the A|Wear sale for £12. (You know how I love my bargains). 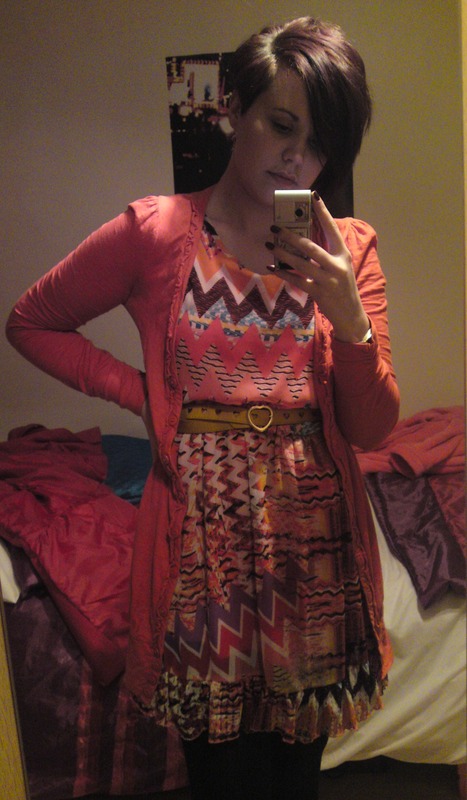 I paired it with my orange cardigan from Miss Selfridge and a mustard heart belt to give it a better shape. It’s perfect to wear for work, its comfortable yet adds some colour into your day. Hope you’re all having a great Monday! (Can you sense my sarcasm?!) Have fun!